It's worth noting that this is the guy's corrected and proof-read version. My rant follows. For all you people who complained about my grammer i have changed it just for you, buddies. I made a couple spelling mistakes not on purpose but because i was in a rush typing. Back to the point, I am a student in grade 11 that is willing to tutor your child inorder to achieve higher expactations in school. If they need a passing grade to pass there grade i will be honored to help. The ages that i am framiler with teaching are those of middle school level or elementary due to the fact i got straight A`s in all chorses; and still at highschool level. I have a very good price range i charge due to the fact it is based of what you want to offer. My future goals are to become a professor/teacher or real estate. Reason i am saying that is because it would be good to have tutoring as a backround inorder to get accepted into the schools i need to attend. Now the choice is yours, if you need a tutor or know somebody that does give me a email to let me know. 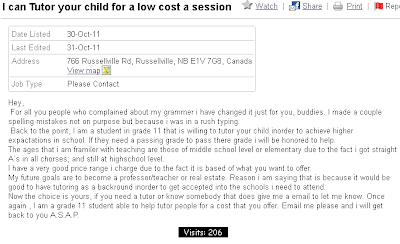 Once again , I am a grade 11 student able to help tutor people for a cost that you offer. Email me please and i will get back to you A.S.A.P. This is absolutely deplorable. It's not only unacceptable that a kid in grade 11 would write so poorly, but many magnitudes of order worse that one would write worse than a third-grader should, and have the audacity to believe he's qualified to teach others. Beyond that, I'll say again, this is the proof-read and corrected version! This is the version the advertiser believes is most correct! Kid, if you're reading this, please show this ad to your parents. Tell them you need a tutor. Tell them you need help. Tell them they've let you slide too long, and by encouraging you to have an inflated sense of self-esteem despite lacking the basic skills and merit to justify your ego, you're failing. Let them know that the people who are encouraging you to be a tutor are actually hurting you by lying to you about your abilities. Get some remedial education to bring your English skills up to a basic level, because you're advertising to the world that you don't know what you're doing. Further, any teacher who gave you an 'A' for work like this should be hauled before the relevant professional body to have his or her credentials examined. It's unconscionable that an educator would allow a pupil to believe he's met expectations with work like this. I hope I was not unclear.